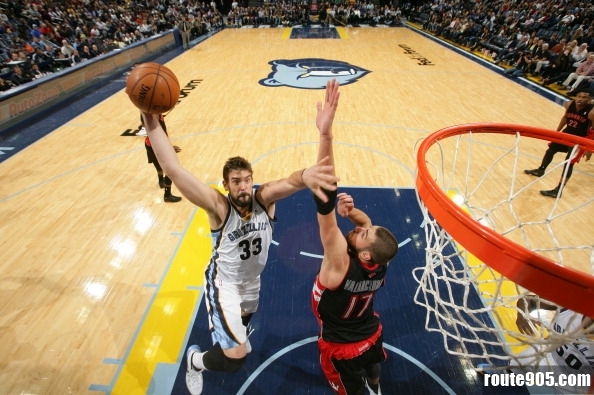 The Toronto Raptors is showing interest in acquiring the Memphis Grizzly Big man, Marc Gasol. His team is at the top of the Western Conference mainly because of his solid production averaging 19.4 ppg, 7.8 rpg, and 3.8 apg. It may not come as a surprise that other NBA teams would also try to sign him once he hits Free Agency. According to The Globe and Mail, If Marc Gasol doesn’t re-sign with the Grizzlies, the Toronto Raptors will try to covet him of signing with the Raptors. “A player that increasingly intrigues Raptors management is Memphis centre Marc Gasol. The Toronto Raptors already has the younger Jonas Valanciunas at the Center position, but the Raptors front office are having doubts that he can hold the Center position deeper in the playoffs. The Toronto Raptors are lacking in that Center position. If they successfully sign Marc Gasol, then The Raptors would be an instant Favourite to get to the finals. This entry was posted in NBA, Raptors News, sports and tagged free agency, marc gasol, NBA, raptors, sports, toronto. Bookmark the permalink.